When Carmen Beteta walked away from the security of convent life at age 19 to care for two frightened, abandoned girls, she took little more than the clothes she wore and a key to her parents’ empty house in Tegucigalpa. She had no money, she had no job. She had no idea how she would survive or provide for the girls’ daily needs. Yet neither her resolve nor her belief that God would provide ever wavered. “God will never leave me” she told church officials, breaking her commitment to the convent where she was a pre-novitiate. Haunted by the sadness in the two girls’ eyes, upset by the failure of the institutional church to provide needed help, Carmen walked away into a new life, one she never could have imagined in her wildest dreams. In her mind, she was merely obeying God’s call, a call she had heard her entire life. One of Carmen’s happiest childhood memories was learning that her mother was pregnant with her baby brother. As a young child she was drawn to babies with an irresistible urge to hold them. “My mother would give me a hard time,” she laughs. “She said I had to be older before I could hold them.” Today Carmen is mom to more than 190 children at Hogar de Ninos Nazareth, a home for abandoned children in Comayagua, Honduras. Born in 1966 in Colon, Honduras, Carmen grew up in a strong Catholic home. 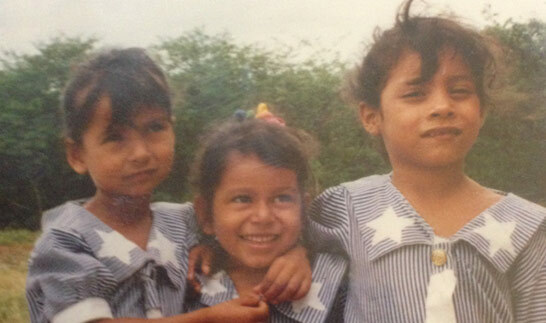 Carmen’s father left Honduras and went to the U.S. when Carmen was in the second grade. Her mother left the following year. Carmen and her two sisters were left in the care of her grandmother. Grandmother had argued that the girls should stay in Honduras at least until they finished 6th grade. They did not think the U.S. was a good place for children. When they finished 6th grade, Grandma lobbied to keep the girls until they finished colejio, or the equivalent of high school. While her entire family attended church each week, Carmen displayed a religious devotion that far exceeded that of anyone else in the family. “I went to church more than my sisters,” she recalls, “and I loved going to Bible studies.” Carmen’s church activities always seemed to revolve around children. At age 16 the church leaders asked her to teach a group of children between the ages of 9 and 11. With such a focused involvement in church work, “I never had time for a boyfriend,” she recalls. Her sister used to tease her about that. “She’d tell me that I should take my bed to church,” laughs Carmen. The absence of a social life did not concern Carmen. Her hopes for the future began to take shape. She thought about going to remote places like Honduran mountains–places other missionaries wouldn’t even want to go. She always thought about working with children. As her church activity increased, Carmen talked to her family about her desire to enter a convent to devote her life to religious work. As a compromise, her parents agreed to let Carmen enter a convent after she finished her studies to become a teacher. They kept hoping that something would happen to change her mind. Carmen, however, was merely marking time. “I did not want a career, but I followed my parents’ wishes.” While she was in school she actively participated in a variety of religious youth groups. In addition, she would spend weekends at the convent. When she graduated at the age of 18, she entered the convent. She had wanted a convent that worked primarily with children. Unfortunately, the only religious order that was dedicated to children were the Sonascas. This group of nuns worked in orphanages. In order to join this order, one had to go away “for a long time” to study, including some time in Italy. In addition, these nuns wore long, black habits. She did not like the idea of having to wear a long black habit, especially when working with children. She joined the Franciscan order and was assigned to work with young people. She had the opportunity to teach. She was in Tegucigalpa for about 5 months then went to Comayagua where she was to go through the pre-novitiate and novitiate stages of her induction into the religious life. She was happy in the convent. For her it was a peaceful, fulfilling environment. Her parents, however, were very upset about her decision to join the convent. They broke off all communication with her. No phone calls and no letters. Just a long painful silence. It was a standoff she’ll never forget. “I kept writing letters and praying.” One day an envelope arrived for Carmen. Enclosed in this single envelope, Carmen’s mother and father had written separate letters. “My mother asked me to forgive her and admitted they had been wrong.” My father said he just wanted me to take care of myself the same way he took care of me. He also said that he gave me his blessing. And the blessing of the Father, the Son, and the Holy Spirit. I have kept these letters. They are among my most precious belongings. This was a battle that was won by God,” Carmen quietly observes. Life with the Franciscans turned out to be quite disciplined. Success in this convent depended heavily on one’s maturity and desire to serve the Lord. Carmen advanced through the training more quickly than some of her classmates. She earned the respect and trust of the Mother Superior. “This was a real growing period. I felt so peaceful because I had a lot of time to spend with the Lord.” Her church activities rotated among a variety of tasks. One day she might lead prayers in church. On another day she might work with children. The assistant simply said that the mission of this convent did not include taking in children. She left. Carmen told the woman to come back later that day. She said she would do what she could. She then talked to the assistant, but to no avail. The convent was not going to take in these girls. Carmen could not get the image of the girl’s faces out of her mind. She prayed for guidance. Finally, she decided that “these girls need me more than this convent does” and decided to leave. She informed the assistant that she was going to leave the convent that very day and take the girls to care for them. “I think the Lord would rather me be with these children. I can’t picture this–we sit here talking so peacefully while they are out there in such need. I want to get out of here.” The assistant was appalled. “You can’t do that. You don’t have permission. It’s illegal.” The archbishop was also out of town, so he could not arbitrate. Carmen asked to see the Mother Vicaria who also insisted that one couldn’t just leave the convent, just like that. However, Carmen said she was leaving that day, with or without permission. Carmen’s determination was founded on God’s promises to care for the orphans. Even without knowing how she would care for them, Carmen believed God would provide for her. “I used to read Isaiah 55:1 to my sister, “You who have no money, come buy and eat! Come, buy wine and milk without money and without cost.” For Carmen, money simply was not an issue. Carmen left the convent and picked up the girls. “I didn’t have one cent. We didn’t even have toothbrushes. I found this man I knew. When he saw me dressed differently, he asked what happened. I told him the situation and he gave me two dollars. It was enough money to catch a bus to Tegucigalpa where my parents owned a home. I had a key.” Another friend, however, crossed paths with the three and drove them to Tegucigalpa. As soon as she arrived in Tegucigalpa, she and the two girls, Maria Elena and Alba Luz, joined the local church Carmen had attended prior to becoming a nun. Carmen approached a priest who operated a school for children of affluent families. “I told him I needed work, and he turned every color you can think of,” she laughs. He said, “You’re going to be put in jail for this. Don’t you know it’s illegal to have children like this if they are not your own?” This is so crazy! I told him, he could say what he wanted, but I’d already gotten past the most difficult hurdle–a release from my convent. If I go to jail, well that’s no problem. Afraid of the legal consequences, the priest nevertheless agreed to give Carmen a class to teach. Back in Tegucigalpa, Carmen renewed her acquaintances with a group of mothers of children she had cared for previously. “They were so happy I was with these two girls instead of the convent.” This small group helped Carmen lay the groundwork to form Hogar de Ninos Nazareth. “We took the first step and God was always with us,” she affirms. The mothers kept her so busy in the next few days that Carmen had no time to begin teaching her class. “People were always inviting me to their homes. The mothers helped get clothes for the girls. They told me about some children whose mother had serious mental problems. They had been taken away from the mother for a while and placed in a government home about an hour away from Tegucigalpa. When she got better they had been returned to her. Her condition worsened and now the children were living first with one neighbor and then another. They were about 2 years old, a boy and a girl, and they were ill.
She immediately began to look into what it took to establish an orphanage. She learned that she would need a committee of support, a board of directors, and a way to show that she had financial backing. She gratefully accepted the aid of an attorney with the congregation and that of another woman who had worked in projects assisting children. With their help, Carmen formed a board of directors and moved to a small, rented house outside of Tegucigalpa. She was there almost two months. During that time the six-year old brother of Maria Elena and Alba Luz joined the group. Meanwhile, a nun from the Franciscan order Carmen had just left offered her a house in Comayagua that she had inherited. It was a large abandoned house that had enough property for Carmen to grow vegetables. 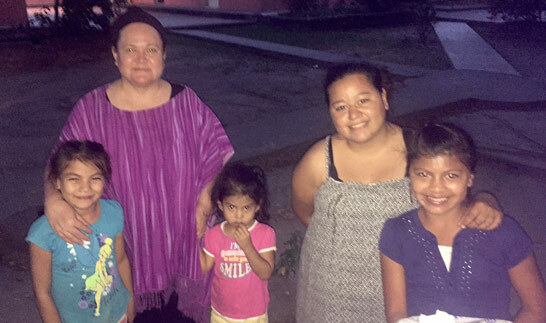 Carmen jumped at the chance, so then Carmen and her children moved to Comayagua. Carmen and the older girls scrubbed the house from top to bottom. Approximately 20 days later, American Air Force personnel learned she was there. On their off-duty time, a number of soldiers volunteered their help. “We got a water tank. We received so many canned goods and clothes.” The Air Force volunteers brought damaged mattresses, 16 metal beds, and built some makeshift bunk beds. “They weren’t very good,” Carmen recalls, “but they worked.”. The Air Force volunteers also provided the manpower to cook, clean, and perform numerous tasks needed at the home. It was help that was sorely needed. Twenty-five days after her exit from the convent, Carmen was single-handedly caring for 17 children. “God provided for us,” says Carmen. One day she found herself down to the last of her food supplies. She did not know what she was going to do. So, she sat down with the four oldest girls and told them that the following day they would have to go with her to offer their services to a local farmer who was harvesting onions. The farmer was hiring, there was plenty of work and they would work the day to get the money they needed to buy food. Later that day, a man came to the door, asking if they had a cart he could use. He had promised God that if he had a good harvest he would donate food to El Hogar. He had five 100-pound bags each of beans, corn and rice, as well as an assortment of vegetables. “God opens the way, God provides,” says Carmen with a smile. Volunteers continued to miraculously enter Carmen’s life just when she needed them. Carlos Yuja, a very well respected local business man, who owned a hardware store, started visiting the home every weekend after learning about the project from a friend. He brought bread each week and played with the children. Carlos recruited even more people to help. A year after the move to Comayagua, Carlos introduced Wayne and Char Merz and Brian Kamstra to Carmen and the children. Wayne, Char and Brian were in Honduras scouting locations where they might bring American teenagers to work on service projects. When they arrived at Hogar de Ninos Nazareth, the pieces all fell into place. In 1989, they brought the first group of teenagers from Michigan and Ohio to work at the home. The work team found plenty of home repairs and other tasks to keep them busy during their stay. They, however, had bigger plans for their ministry. They wanted to build Carmen and the children a permanent home. Carmen petitioned the local government for some land. In 1990, three teams of teenagers traveled to Honduras to build a new facility closer to Comayagua. Carmen could not have been more excited about the development. Work continued every year through efforts of numerous teenage work teams from the Christian Reformed Church. Today there are two locations, a farm for the older boys, including classrooms, a wood shop, welding shop and farm animals. The main complex, for all the girls and the younger boys includes classrooms, play areas, laundry facilities, sewing room and a room where the children can learn crafts. Now a gifted staff provides a warm, loving, Christian atmosphere at both locations where the children can flourish. “That is the biggest challenge,” Carmen says — making the children feel like they are in a family rather than in a facility. She makes sure the children spend time together as a family, such as the daily prayer time after dinner. Carmen and her staff intentionally shower the children with affection they never would have experienced had they not found their way to the home. The army of volunteers remains as fiercely committed to Carmen’s ministry as Carmen herself was the day she walked away from the convent. A nonprofit organization was formed for the children of Hogar de Ninos Nazareth with Wayne, Char and Brian as founding members. Today that organization, All God’s Children (AGC, Ltd.), offers a sponsorship program to those who desire to provide on-going education, spiritual development, food, clothing, and medical care for an individual child. Sponsors get to know one of the children through letters, pictures, and the exchange of small gifts. Sponsors may also participate in a work team, volunteering at the home and meeting the child they sponsor. 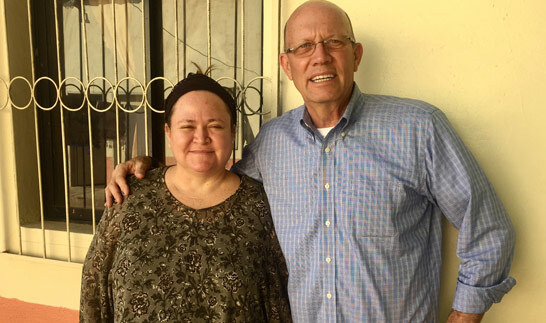 Carmen accepts the flurry of activity around her ministry with gratitude, but also with a deep sense of how God is keeping his promise to care for the orphans of the world. While the number of children passing through her doors continues to grow, Carmen focuses on the unique needs and individuality of each child. “I could write a book about each one,” she smiles. From her children Carmen has learned to “be happy, and to fight because they are fighters, and to be courageous. Whatever I give to them is nothing compared to what they give to me.” For Carmen, the rewards of her work are simple, but invaluable–“My biggest reward comes when a child is given to me, when I get that first smile, when a baby says ‘mom’ for the first time.” When a six-year-old child walks up to her and says, “Mother, I love you.” She never would have imagined.